Blue-headed Vireo male has blue-grey hood, contrasting with white spectacles, chin and throat. These spectacles are white eye-rings, joining together by a white band above the base of the upper mandible. Back is bright olive. Dark wings show yellow-tinged wing bars and tertial feathers. Dark secondaries have greenish-yellow edges. Tail is black with fine yellowish-green edges. Underparts are white, with bright yellow sides and flanks. Vent and undertail coverts are white. Thick, short bill is black, with greyish patch at the base of lower mandible. Upper mandible is slightly hooked. Eyes are dark brown. Thick legs and feet are dark bluish-grey. Blue-headed Vireo feeds mainly on insects such as bugs and beetles. They can consume and process prey with hard carapaces because they have strong jaw musculature for a song bird. They also feed on moth caterpillars, and fruit and berries in winter. Blue-headed Vireo is a common host of Brown-headed Cowbird. 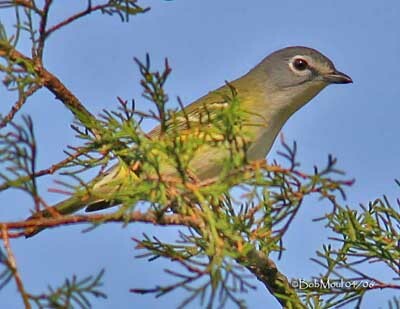 However, populations of vireos are considered to be increasing in some parts of the range. Both sexes are similar. Female is slightly duller than male, with partly grey hood. She is as large as or slightly larger than male. Juvenile resembles adults, but duller and browner. Cassin’s Vireo, (Vireo cassinii) with brownish-grey crown. Their ranges slightly overlap. Plumbeous Vireo (Vireo plumbeus) has grey upperparts and duller body. Bell’s Vireo (Vireo bellii) lacks spectacles with only a part of the eye ring. They were formerly known as Solitary Vireo. Blue-headed Vireo is a pleasant songster. It is described as a “slow but persistent singer”. Syllables of the song are set off from one another by long rests. Each note is clear and loud, and the song results ringing out, and may be heard for very long distance. Notes are successively rising and falling, sometimes with regular alternation, as if the bird asks a question. Hence the name “question-and-answer bird” suggested for this species! Blue-headed Vireo lives in mixed woodlands such as riparian woodlands, pinyon-juniper woodlands, mountain canyons, and montane forests, mainly ponderosa pines. 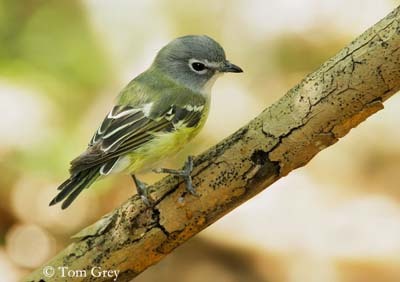 Blue-headed Vireo breeds in most southern Canada to Newfoundland, south along Atlantic coasts states, and southwards in Appalachians. It winters in south-eastern United States to Central America. Blue-headed Vireo is highly insectivorous. It gleans for food from twigs and foliage, in the lower and middle levels of trees. The bird moves slowly through the branches, perching and capturing insects in its stout hooked bill. It may perform some flycatching, with fluttering wings to reach and awkward gleaning site. Blue-headed Vireo is a common Brown-headed Cowbird host. If Cowbird lays eggs before the Vireo, this one builds a second floor with nesting materials to cover them, but if a cowbird nestling is in the vireo’s nest, its own chicks will be completely covered, and they will be die through starvation. Males arrive by mid-April, and defend very large territories. Females arrive few times after them. Most individuals are yet paired. 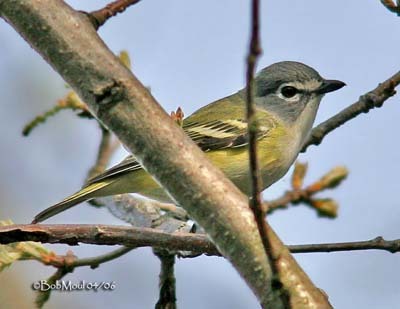 Blue-headed Vireo arrives in early spring on breeding areas, and often remains until mid-October, longer than the majority of migratory song birds. Females prefer to pair with males holding the largest territories (from 1,5 to 6,5 hectares). But for female, territory is not enough! Male has to build a ‘courtship’ nest, to show its great domestic possibilities. But after pair-bond is established, this courtship nest is often abandoned, and pair may choose another place for its first brood. Male repeats a distinctive, monotonous single phrase near the nest. This song identifies a male to its mate and maintains pair bonds. Male and female Blue-headed Vireos have a cooperative nesting behaviour. Both build the nest and incubate the eggs. Both sexes are highly vocal and give calls to one another while foraging together. Blue-headed Vireos are monogamous, and even males don’t guard females against other males, females don’t accept extra-pair fertilizations. Maybe male and female stay together on wintering areas. Predators of the nest, such as Blue Jays, are strongly attacked by the Vireo pair. One vireo swoops at the head of the jay from one side, and the other vireo hits the predator from another direction. Both mates utter rapid chatter-growling at the same time. Blue-headed Vireo’s nests are also protected by the vicinity of Cooper’s Hawk nest. Jays and crows are preyed upon by them! Blue-headed Vireo is a migratory bird. 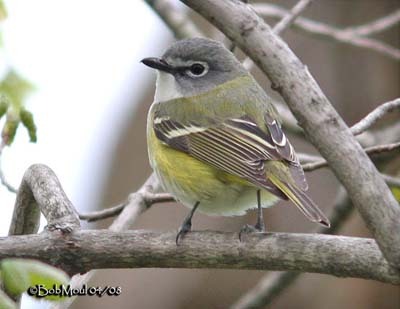 Blue-headed Vireo has a weak flight, and performs rapid wing beats. Blue-headed Vireo’s nest is a hanging cup. It is built in a forked twig by both adults. Nest is made with twigs, grass, small bits of bark, stems, and silk of spider webs and cocoons. Interior is lined with grass and hair, rootlets and conifer needles. The nest is about 4 to 30 feet above the ground, in trees or bushes. Female lays 3 to 5 white eggs with black and brown markings. Incubation lasts about 12 to 14 days, shared by both sexes. Altricial chicks hatch with some tufts of down. They are fed by both parents. Young fledge at about 13 to 14 days after hatching. They are divided up by parents. Then, they are raised separately by each parent.